Back by Popular Demand: From Fleece to Cloth—Shearing, Spinning, and Weaving Witness a living tradition, dating back thousands of years, Sunday, April 15, at Durand-Hedden April 2018 – Spinning—twisting a fiber such as wool into thread or yarn—and weaving that thread or yarn to create cloth is a skill dating back thousands of years. 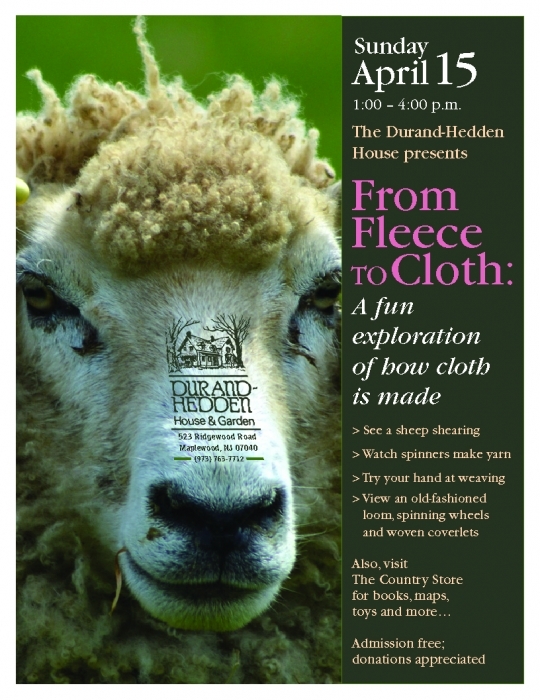 On April 15 from 1:00 to 4:00 p.m., Durand-Hedden visitors will have the opportunity to explore this tradition and witness how cloth is made, from shearing sheep to spinning thread to weaving into cloth. • Watch a shearer collect fleece from woolly visitors from Kafka Farms • See members of the Essex County Spinners Guild demonstrate that the craft of hand spinning is alive and well in the 21st century • Watch weaving students and a fiber teacher from Peter’s Valley School of Craft show the basics of how thread is woven into cloth • Participate as Columbia High School craft students lead young visitors in a weaving activity • View Durand-Hedden’s frame loom, spinning wheels, and woven coverlets – once commonplace in the 18th and 19th centuries The event is free. Donations are appreciated. Exhibit on Maplewood Be sure to also see the fascinating exhibit on the impact of World War I on Maplewood, Maplewood Remembers World War One. Country Shopping 12:00 to 5:00 p.m. Check out our Country Store’s historic-themed treasures: early American games, books, and toys; facsimile documents; quill pens and ink; historic cookbooks; cookie molds; tin lanterns; and reproductive decorative items and ceramics. You’ll also discover the hard-to-find original Doors of Maplewood poster, Smile: A Pictorial History of Olympic Park 1887-1965, and the new acid-free reproduction of the charming 1931 Map of Maplewood. About Durand-Hedden House and Garden Durand-Hedden House is dedicated to telling the history of the development of Maplewood and the surrounding area in new and engaging ways. It is located in Grasmere Park at 523 Ridgewood Road in Maplewood. For more information or to arrange group tours call 973-763-7712. You can also visit our website at durandhedden.org and find us on Facebook and Twitter.